Three Nebraska football seniors will make the trek to Chicago on Monday to represent the Huskers at this year's Big Ten Media Days. Those players are wide receiver Stanley Morgan Jr., defensive lineman Mick Stoltenberg and offensive lineman Jerald Foster. Get to know each player a little better before Big Ten Media Days. Senior wide receiver Stanley Morgan Jr. is expected to set quite a few records at Nebraska in 2018. One of those records? Reaching 1,000 reception yards in a single season. If he gets there, he'll become the first Nebraska receiver to accomplish the feat in school history. Morgan nearly reached the 1,000 yard mark in 2017, falling short by only 14 yards. His 2017 season was impressive regardless of that record, racking up 986 yards on 61 catches. Those numbers have earned Morgan the attention of many outside of Nebraska, too. The Biletnikoff Award, given annually to the best wide receiver in the country, announced its 2018 preseason watch list on Thursday. 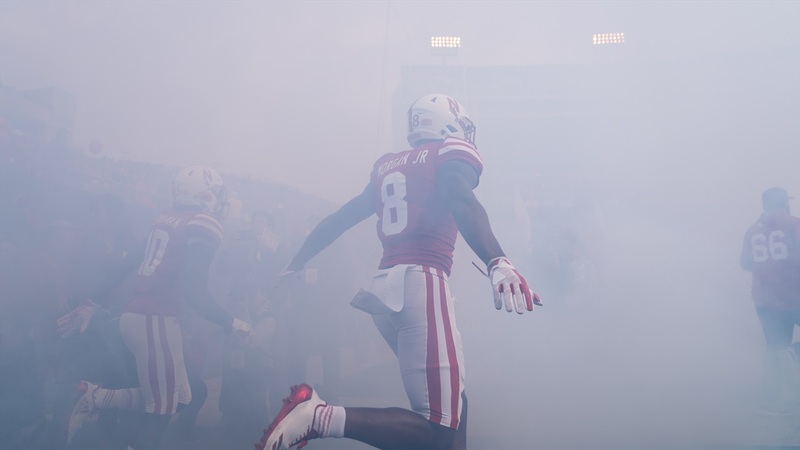 Morgan was one of two Huskers on the 50-man list. For Morgan, he has unfinished business in 2018. Some of his goals were abtainable in 2017, but they fell just out of reach. Former Nebraska wide receivers coach Keith Williams knows firsthand how Morgan reacted to that. "If you asked him about the 1,000 yards, he’d be more pissed off about the fact he could have had it last year than he is motivated by trying to get it this year," Willliams told Hail Varsity. Will Morgan meet those goals in 2018? That's the plan, and Morgan will likely be asked about those goals in Chicago. Mick Stoltenberg has been through a lot as a Husker, including a couple of coaching changes and a switch in defensive schemes. The Gretna, Neb., native has done his best to navigate it all with ease. After starting 12 games as the nose tackle position for Nebraska in 2017, Stoltenberg is expected to return as the starter to the position again in 2018. As a junior, Stoltenberg tacked up 33 tackles. That was six more than he totaled in his first two seasons with Nebraska combined. In addition to what Stoltenberg brings to Nebraska on the field, he's also a vocal leader off the field. That's evolved in time, and he's also seen the relationshipsgrow on the team over the last several months. "I feel we've built a lot of camaraderie through this offseason," Stoltenberg told Hail Varsity. "There's obviously been a lot of talk through the summer and offseason about the strength and conditioning program — and we've obviously made a ton of gains — but we're also making a lot of gains as far as being a more cohesive team and that's obviously going to be the most important thing [this fall]. "The physical stuff is huge too, but guys playing together and not giving up on each other is very important. I think that's something that's been developing over the last few months here." Offensive lineman Jerald Foster joins Stoltenberg as one of two Nebraska-natives headed to Big Ten Media Days. That is if you don't also count Coach Scott Frost in the equation. Foster hails from Lincoln, Neb., and is preparing for his senior season with the Huskers. Foster started at left guard for all 12 games in 2017, ultimately earning honorable-mention All-Big Ten accolades. He also served as team captain last season. While Nebraska ranked second in the Big Ten in passing (277.5 yards per game) and posted the fifth-highest passing total in school history (3,330 yards), there was still plenty of room for improvement on the offensive line. Foster will be a big part of making those improvements happen. Nebraska's new offensive line coach Greg Austin sees the potential, too. Could Foster be on that list? Yes or no, Austin is expected to push every player on the offensive line. Foster included.